Michael was excited - Emily was a little disappointed (she wanted another girl) but both thought it was neat that he would be the first (and only at this point) to carry on the T name. Congratulations! We can't wait to meet him. We love you!!!! Yeah! 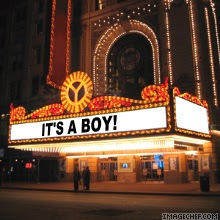 Congrats on your little guy! God's blessings to you all! I was thinking boy! Yahoo! We're excited for you guys! Thanks for sharing the awesome news! Congatulations!!!! We are so excited for you guys and excited Xavier will have a boy 2nd cousin!